My mother-in-law who recently passed away was a wonderful lady. Everything you read in the comic strips about ‘monsters-in-law’, she was not. Once, I casually mentioned that I liked to eat chicken feet, and guess what? Every time we visited my in-laws in Ipoh, she would cook or order same braised chicken feet for me. The same is true for sea cucumbers. Anyway, now that she has left us, I guess my pilgrimages to Ipoh will slow down in frequency. Which means that I am going to miss the wonderful Ipoh food. But at least I can still blog about it can’t I? 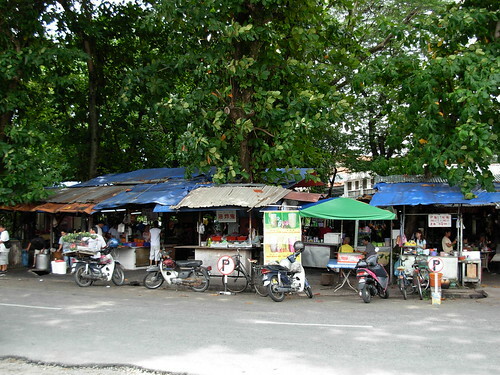 Actually, Tai-shu-keok is a collection of shanty stalls located in the shade of some huge sea almond trees in the Pasir Pinji area. 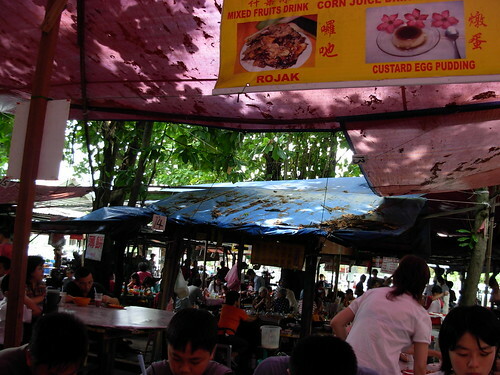 Although the conditions were a little shabby and dirty, it was very popular with Ipoh folks. I saw many office workers including some men in ties. Traffic was chaotic and we had to park our car far away. Some of you may have heard of the legendary Four Beauties (of China) or 四大美人. Did you know that Ipoh too have 4 beauties. Here they are. 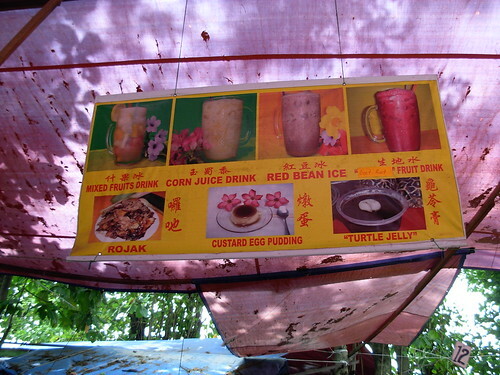 The Four Beauties is actually the name given to 4 super-sized mixed fruit drinks (top of banner). Notice the many dead leaves on top of the canvas canopy. Frankly, I didn’t find the food any different for the other places. But then I am not a discerning ‘foodie’. Like the Dance Floor (tv show) judges, my only adjectives are wonderful and fantastic. Anyhow, I enjoyed the unique environment of the Big Tree Foot’. 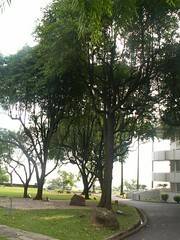 I liked the huge sea almond trees. I don’t recall ever seeing such huge ones in Singapore. Next time, I will blog about the famous Ipoh Bean Sprout Chicken. 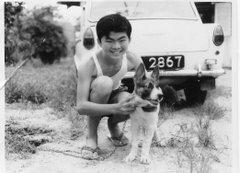 Chun See’s kind invitation to me to post the occasional guest piece on his blog has led me to reminisce about some of the ways I passed my time as a young teenager in early 60s Singapore – but I have missed out perhaps one of the most important, which was plane spotting. 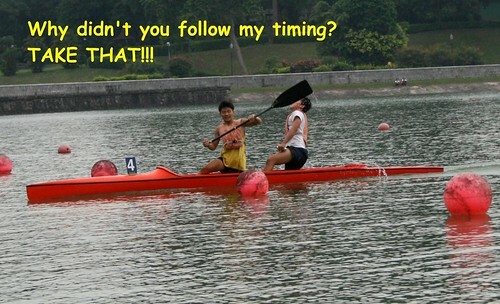 But first a warning – some of today’s Singaporeans were a little dismayed at my recklessness whilst paddling my dug out canoe (no life jacket, no safety boat, casual trips across to Pulau Ubin etc) – my exploits whilst plane-spotting were even worse! You have been warned. So why plane-spotting? Well I was certainly interested in aircraft, with a father in the Royal Air Force I had grown up around them. But in Singapore my main interest was photographing aircraft – including getting close to them if I could. My hobby was greatly encouraged by my father buying me my first ‘real’ camera. We went into Changi village and after a bit of haggling came away with a Samoca LEII (I probably still have it somewhere, but its years since I used it), a simple manual 35mm which even had a light meter built in to the body. I can’t remember what we paid for it but when we got back to the UK I was pleased to see that it cost just under £20 which was certainly more than in Changi village – then as now Singapore prices were good! There were several of us who went plane spotting. Here (courtesy again of my old friend Ray Shaw) is a photograph of three of us, myself on the left, then tiny Malcolm with his camera and finally Kerry on the right. So where did we go to photograph planes? Well Changi obviously. In those days the Upper Changi Road went right across the main dispersal area so our school bus or gari ride was always a way of checking out any interesting planes. And the other location was Singapore’s international airport at Paya Lebar – we took a bus along the Tampines Road, then a trek through some Kampongs (I still remember the pigs and chickens) to the end of the runway or a further walk to the terminal building itself. Those were the days of Boeing 707s, and Douglas DC8s. Singapore was already an international hub with planes from the USA, South American, Australia etc. 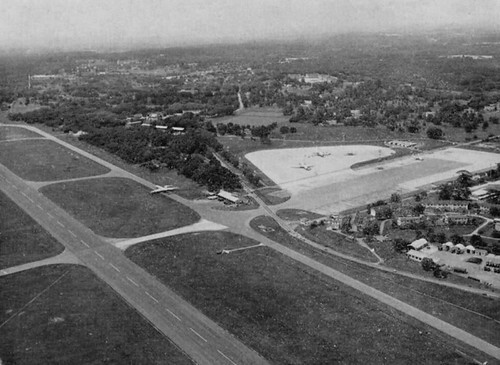 Photo of RAF Changi from the air and showing the dispersal area (with Upper Changi Road running across the centre of the picture) contributed by Barry Fagg to Memories of Singapore. 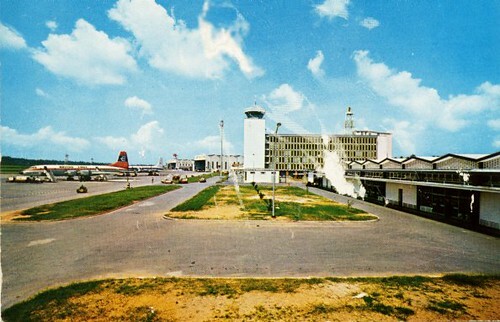 Photo of Paya Lebar Airport courtesy of Memories of Singapore. But the attempt to get exciting photographs of aircraft sometimes got us into trouble. After a few attempts at photographing aircraft landing at Paya Lebar we decided to have a go at Changi. The north end of the runway was open and we could get to it easily so two of us took our cameras and crept as close to the end of the tarmac as we dared. A single Shackleton (a large four engined aircraft based on the WW2 Lancaster bomber) was doing what we called ‘circuits and bumps’ so as it circled to land we got ready with our cameras. I swear the pilot must have spotted us and decided to give us a scare for we were dismayed to see the plane coming in to land very low indeed. As it got nearer we abandoned any photography and flattened ourselves on the ground hardly daring to believe that it could miss us. It roared overhead, a few feet above us, the ground shook and our ears protested. I stole a quick glance up, the sky was blotted out by a mass of metal and rivets. Then it touched down and took off again, we got up on shaking legs and ran! Never again! But sometimes there were rare and interesting aircraft that demanded a closer look – particularly since without a telephoto lens that was the only way to get a decent picture. Around the time of the first US space shots some very interesting US aircraft arrived at Changi – presumably engaged in tracking the space shots. One aircraft bristling with radar and electronics was spotted from the school gari on the way home. I was back shortly afterwards with my camera. Getting off the bus before it reached the airfield I walked across a field of tall vegetation behind the dispersal area hoping not to be noticed – aircraft like these were often under guard. Half way across the field I was astounded to see Malcolm striding openly across the dispersal tarmac from the other side – he wore only his shorts, socks and shoes in a vain attempt to appear to be one of the aircraftmen! His disguise was hardly effective, he was after all not much more than 5 foot tall! He was not even half way across when I saw the military police Land Rover rush out from near the control tower, stop him and take him on board. I did a swift about-turn, ducking low in the vegetation hoping not to be spotted. Malcolm got off lightly on this occasion. But Kerry and I were not so lucky with a further exploit to be told in part 2! There were happy incidents that happened at this street, but also some ugly ones. The happy one first. One day, I was eating at a fish porridge stall run by two sisters. The elder one was quite pretty; in fact, she received some marriage proposals from the port stevedores. But apparently, she was not quite ready, because I saw her operating her stall, busy serving her customers. After finishing my cuttle-fish porridge, and was about to pay her, she told me someone had already paid. I was surprised: “What someone already paid – who?” At that moment I saw a fat and short guy sneaking away opposite the stall, meanwhile giggling to himself ,“he-he.”. I told myself, isn’t that guy CTK. Later I confronted him: “Hey CTK, you are not supposed to pay for me!” He retorted: “I touched 4D, and I pay for you cannot ah!“ In other words he found great pleasure in surprising me rather than spending a dollar or two for the consumed porridge. This was the happy incident. The unhappy incident happened this way. One morning, I saw an unlicensed Indian peddlar selling Mee Siam; the Indian peanut gravy type. He placed a table and a few chairs for his customers. The food was really good. After taking a few mouthfuls, I heard a commotion. A group of about five hefty guys, mostly Indians wearing uniforms, swept down the street. They were obviously from the Environment ministry, chasing after for illegal hawkers. I was caught in the midst of this mayhem. The poor Indian Mee Siam seller was caught flat-footed, rooted to the ground, with the uniformed guys taking away all his utensils. Worst, they chopped up his stall with axes and threw them wholesale onto a medium size truck. I felt disgusted, not only unable to finish the meal, but felt sorry for this hawker. Well I did not have much time to waste and proceeded to my workplace. The second uglier incident occurred this way. After finishing my lunch, I wanted to exit out of Tian Lye Street. Suddenly, I saw a familiar looking detective whacking up a youngster aged twenty something. This huge detective fellow weighed something like 180 to 190 lbs, heavy weight category punched up a supposed to be criminal of say medium weight category. Worst of all, this supposed to be criminal was unarmed. Handcuffing him should be sufficient, not necessary for violence in broad daylight. I did not understand the need of this detective displaying his martial art skill like: punches, chops, neck-locks, knee to chest thrust on this victim of his. In the fifties I saw gang violence, and in the sixties witnessed this sickening spectacle unfolded right under a large PSA bill-board, advertising violence? Sometime I wonder whether this police officer was trying to bring justice to the public, maintaining law and order, or trying to settle a personal score. The moral principle is that all human beings are given birth out of their mothers’ wombs and have lives. In short, all lives, particularly human lives, should be treated with respect and not abuse. 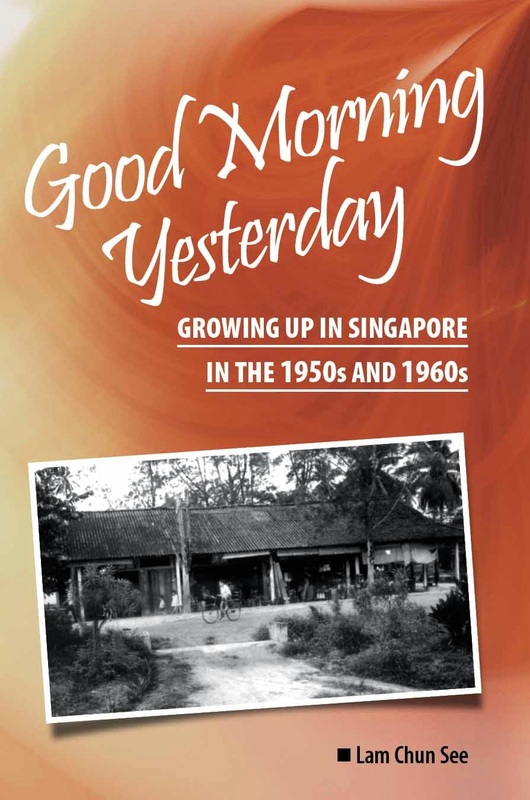 When I started work at the PSA, or Port of Singapore Authority, which was earlier known as Singapore Harbour Board, in the early sixties, I often had my breakfast and lunch at Tian Lye Street. It was located at what is today, the Tanjong Pagar Container Terminal. 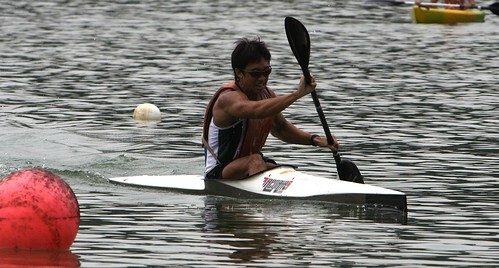 It was quite near to my work place which was at the tail-end of two major roads – Tanjong Pagar Road and Anson Road. 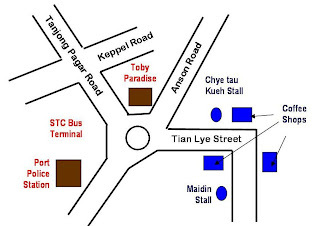 Tian Lye Street was a right angled street, off-shoot from the end of Anson Road, with a three coffee-shops scattered at closed quarters, lined with licensed street vendors on both sides of the street. As you entered the street from Anson Road, after a short distance, there were two coffee shops opposite each others. The food sold was not much different from present coffee shops, but there was a world of difference in the prices. For instance, the price for a plate of char siew rice was fifty cents with a large glass of Chinese tea thrown in foc. A plate of yee mee or hor fun cost eighty cents coated with ingredients like pig liver, pork, large prawns, sotong and kailan or chye sim. What a deal. The cost of living then was low, but then so were our salaries. There were two Cantonese old ladies selling bananas, my favourite fruit, medium size similar to those branded Del Monte sold presently. In Cantonese, we call it ‘hiong ngar chew’. These two old ladies looked like retired amahs making a living in their old age, sitting side by side just to have company, especially someone to talk to. Guess what was the price of three bananas? Ten cents. Meanwhile, the chye tau kueh, fried by an old Teochew man with his son assisting him, did a roaring business, frying up a storm – mainly the white type, with egg, minus the sweet sauce. This was his specialty; but if someone asked for the sweet type, no problem, he would kindly oblige. One of our Operations officers, Michael simply loved the chye tau kueh, and before he ate, he would hum his favourite tune : “Gura Racha, Gura Racha”, some kind of Mexican tune. The best part was, Michael never failed to buy extra packets of this lovely food for his staff, and one packet was reserved for me. Isn’t he a great officer? I will stop here. Next time, I will blog about three unforgettable incidents that happened in Tian Lye Street, one minor, and two ugly ones. 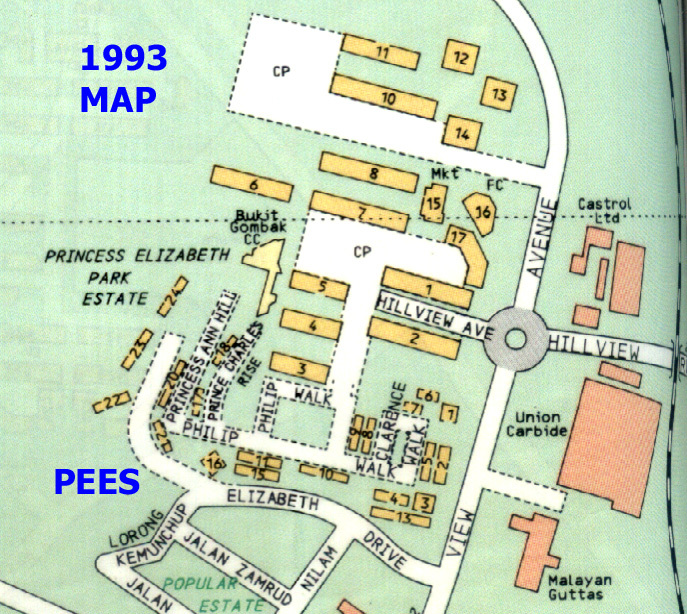 Chun Chew’s earlier article about the visit of Queen Elizabeth II to Singapore reminds me of the housing estate which I lived in when I was young – the Princess Elizabeth Estate, which was located near Hillview Avenue in Upper Bukit Timah. I believe it was built around 1951 to commemorate the wedding of Princess Elizabeth to Prince Philip (the Duke of Edinburgh) in 1947. In all, the estate had 24 blocks of flats. Blocks 1 to 16 were single-storey blocks whereas Blocks 17 to 22 are 3-storey blocks. Block 23 and Block 24 were 7-storey blocks. There was also a school named Princess Elizabeth Estate Primary School. 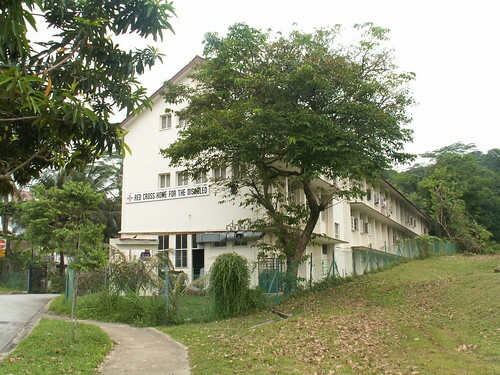 Its premises are now occupied by the Red Cross Home for the Handicapped and the school was relocated to Bukit Batok many years back. I lived on the ground floor of block 17 from 1975 to 1984. 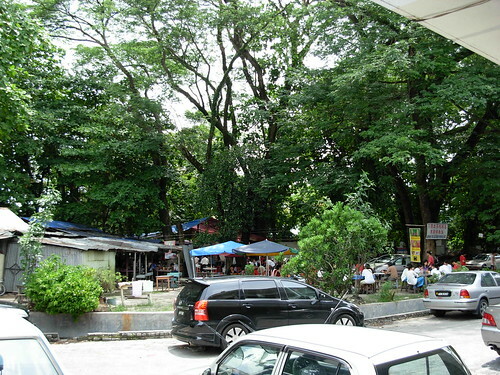 Before that, I lived in the kampung in Hill View Area. 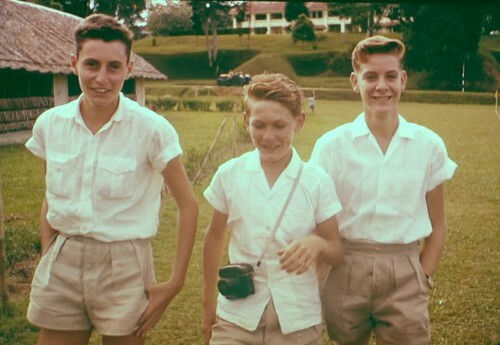 I remember the address was 01-103, Prince Charles Rise, Singapore 23. You might recall that at that time, we had 2 digit postal codes in Singapore. Ours was a four room flat. The 3 bed rooms were really big by today’s standards, but the hall and kitchen were miserably small. Just in front of Block 17 was the Princess Elizabeth Estate Community Centre. I spent lot of time there playing all sorts of games like badminton, basketball, sepak takraw, table tennis etc.. at this community centre. We also played lots of childhood games, like my wooden guns, rubber bands, picture cards etc..
Just beside Block 17 was a small public car park . Parking was free in the mid 70s until the Coupon Parking system comes into effect. 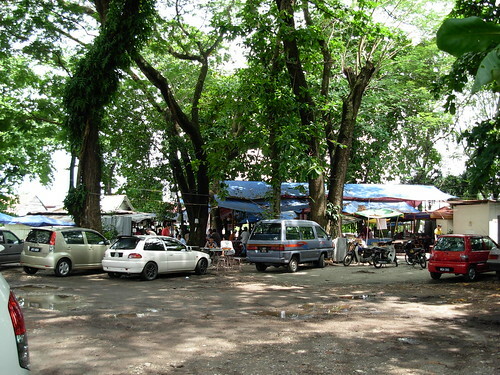 Occupying the same car park was a bus terminal where SBS bus Service 173 and 193 started their journeys. 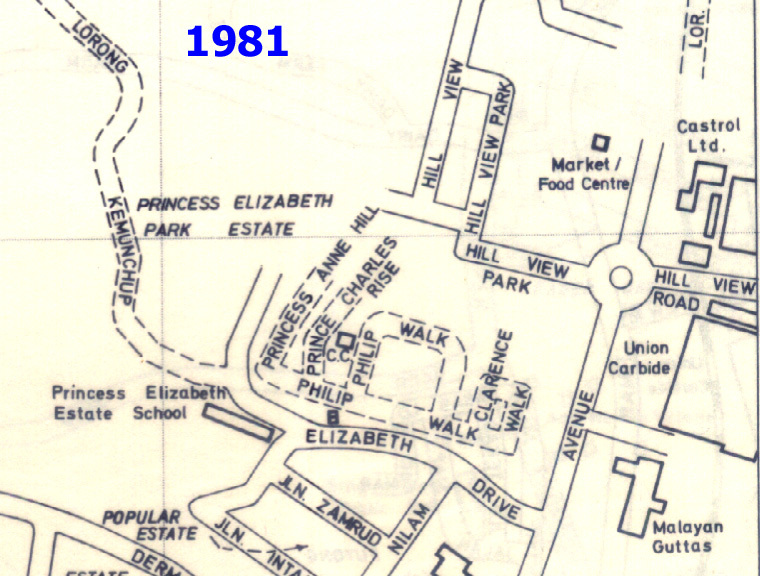 Princess Elizabeth Estate Primary was just beside the bus terminal. There was also a football field surrounded by 3 Single Storey flats. I cannot remember the block numbers. An interesting thing about this football field was that it had a 'centre parting' - same as a kind of hairstyle. The reason was that the residents of this estate walked diagonally across the field to get to Bukit Timah Road to catch other bus services not served by Service 173 or 193. This caused the path to become 'botak' (bald). 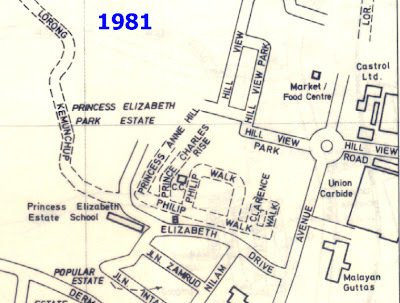 Sadly, like many of the older estates, Princess Elizabeth Estate no longer exists. Today, it is just an open patch of ground awaiting development. Who knows what they will build here in the future; probably another condominium. I wonder if they will reuse the name. This morning I do not feel so guilty about blogging during working hours. I have just created a new blog called My 5S Corner. My motivation for starting this new blog is primarily commercial. Its main purpose is to let people know about my work/business, and especially for potential clients to be able to find me whenever they search the internet to look for 5S trainers and consultants. During this past few years, I have noticed an increased interest among foreign companies in implementing the Japanese technique of good housekeeping and workplace organisation known as 5S. 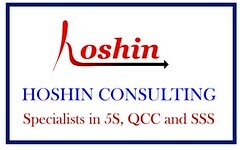 Sometimes they do get to my website Hoshin Consulting. But other times they approach the bigger consulting firms; and then guess what happens. The 'Big Boys' end up subcontracting the assignment to me and the client ends up paying more, and I end up earning less. Recently, I attended a internet marketing seminar where the speaker told us that nowadays, all businesses should set up a blogs. And thus My 5S Corner was born. "I feel knowledge ought to be shared -- especially if people want to learn. It's also part of the general blogger's culture -- we willingly share and help the people we know, and if the cause is worthy. "Learning" is always a worthy cause"
So please do drop by and look around. I will try to blog on topics that will be of interest to the general public as well. My brother Chun Chew (Zen) has also promised to support me with his stories. It helps that he is retired of course. 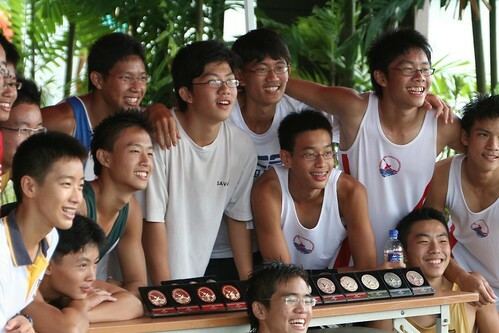 As so often something in Chun See’s blog sets me thinking about my own time as a teenager in Singapore in the early 1960s – this time his report from the National Junior Canoeing Championships. 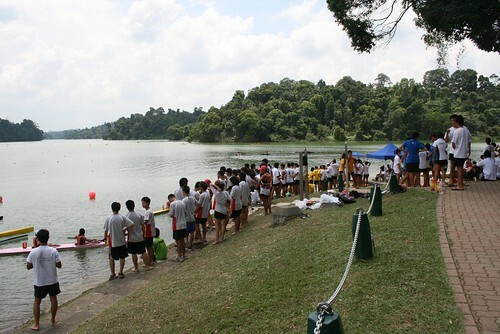 One of my favourite past-times was paddling my old dug-out canoe out from what was then the Royal Air Force Officers Club at Changi – I think this is now the Junior Sailing Club if my modern map of Singapore is correct. Our canoes were stored upside down on a grass slope beside the club building ready for launching. Most young people had rather larger boats made out of planks but mine was smaller and a genuine dug out canoe. 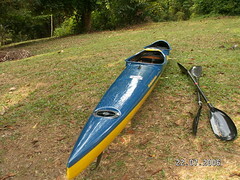 It came without a paddle so I accompanied my father to a boat yard in Changi Harbour where he explained what we needed – unfortunately what came back was a well made – but rather heavy – paddle which I used for the next couple of years building up arm muscle! 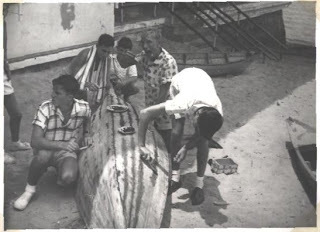 One continual problem was that in the hot sun the wood of the canoes shrank or cracked and needed re-tarring – and (courtesy of my old friend of the time, Ray Shaw) I have a photo of a group of us repairing one of the canoes (I am the handsome one with the towel around my neck). 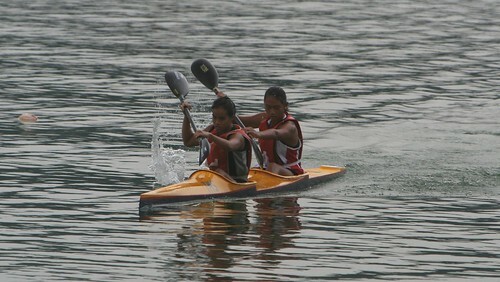 Looking back, I am surprised just how far we got in the canoes. 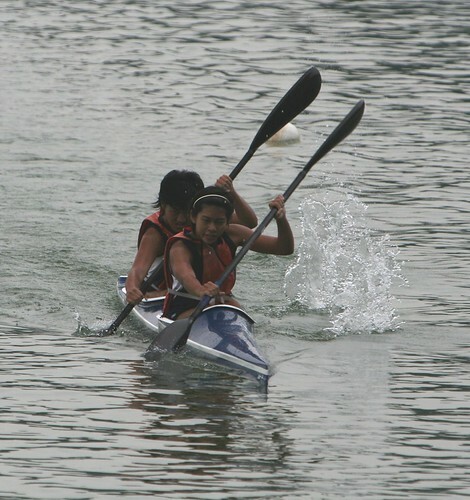 Often a few of us would paddle our canoes for short trips along the Changi coast but occasionally we would take a longer trip across towards Pulau Ubin and a small island or two in that direction – in retrospect and given the tiny size of my canoe - this now seems reckless but we were of course young, fit and excellent swimmers. I do recall landing on a small island with an old house – looking rather like an English country cottage - and finding some bananas growing in the garden. We took a few to eat (a process known in the UK as ‘scrumping’, which is an innocent sounding term for stealing fruit off people’s plants and trees!). 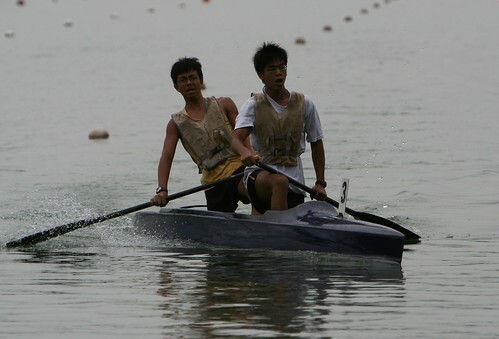 I have hardly been in a canoe since those days but that tiny blue and white painted dug-out gave me a lot of fun. 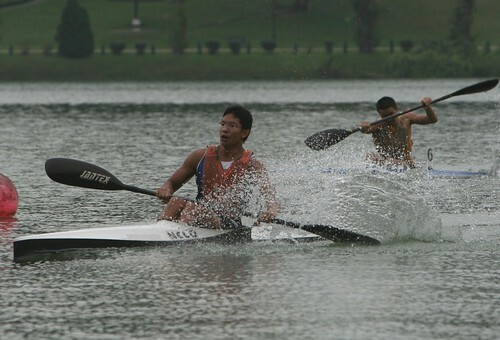 Thus as expected, there was not a whimper of news last week about the Singapore Canoeing Federation’s National Junior Canoeing Championships which was held on 31st of March and 1st of April at the MacRitchie Reservoir. 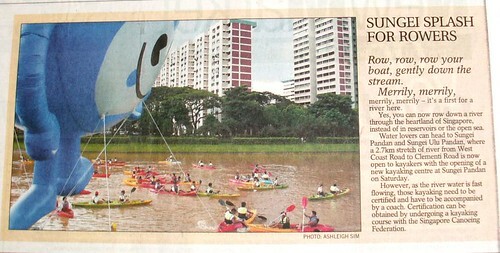 Instead, the Straits Times carried a huge item on 2nd April about kayaking in our rivers; even had a warning that only certified kayakers can participate. - That the girls from Balestier Hill Sec had the loudest screams that even the beef cakes from ACS couldn’t match. - NJC seems to have an official medal collector. She shook the guest-of-honour’s hands at least 6 or 7 times. Oh dear. It looks like news reporting is not so easy after all. I think I will just let the photos do the talking lah. 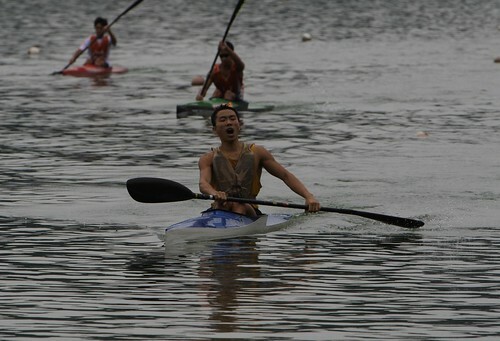 I assure you the youngsters in these photos will have no problem qualifying to kayak in the rivers of Singapore. Acknowledgement: Thanks to my friend Cheng Liang Fang who took all but two of the photos above. Yesterday, this blog was featured in article in the New Paper about older bloggers. I must thank the reporter, Mr Ho Lian Yi for quite accurately reflecting one of the basic goals of my blog, which is to educate and inform young Singaporeans about what their country was like a few short decades ago. He also noted that blogging has helped me to connect with the younger generation. I hope more young people will read the stories I put up here. I should take this opportunity to thank my guest bloggers; especially those from UK - John Harper, Tom O'brien, Brian Mitchell, Tom Brown and Lynn Copping. My apologies if I missed any name. As for the 'local heroes', as Mr Miyagi puts it, there's my brother Chun Chew, and old friends Chuck Hio, Simon Chu and Adrian Chua, and new friends Peter, Victor, Chris and others who share their stories in the 'comments' section. Regrettably, there was one unexpected outcome of the above article. I have inadvertently helped to promote gambling in Singapore. I received an email from an old friend this morning, 'complaining' that the number 2867 was sold out, presumably at the the 4D lottery counters. After the government’s announcement of the Queen’s first visit to Singapore in 1972, the whole island was in a frenzy with the preparation for her visit. The whole of Tanjong Pagar, where our port was located, was to be cleaned up. Since this part of the country was quite unsightly then, an order came down that all the buildings and their surrounding areas needed to be white-washed, spruced up and unsightly parts to be covered up. How? The solution was to rack up wooden panels, like cosmetic cover-up, to hide all ugly sights where the Queen’s motorcade passed through. The seedy bar called 'Toby Paradise', a water-hole for many a tired sailor, was transformed into a dignified place, worthy of VIP’s patronage. 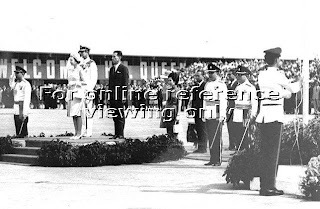 In short the whole island was geared to project an unforgettable image to Her Majesty. All government departments were on their toes, nothing was left to chance. There was no such thing as failure in the CS dictionary for this grand occasion. Many top government staff, I believed, had sleepless nights before the big day arrived. Security was at its best and the top bosses were as though placed on war-footing. The big day came. The whole port was ready for action. Our section, Go-down 46/7, was chosen for the Queen’s yacht, The Britannia to berth. Flowers pots lined all the roads and buildings leading to the berth. As the tugs was pulling the yacht into the berth, our best work supervisor Anthony, dressed in full suit, was commanding his best stevedore, with the best gangway available, to move into position. Anthony looked so smart in his suit that one could have mistaken him for bride-groom that day. The Britannia crew threw down the ropes which Anthony's stevedores quickly tied onto the capstans. The gangway was efficiently attached to the vessel and here came the Queen with her husband Phillip following behind. The Queen came down to inspect the guards of honour, with band striking out the national anthems of both countries. The whole area was practically red-carpeted. Diplomatic corps were at full strength and PM Lee gave a welcome speech and later acknowledged by her majesty. The Queen impressed upon me as lady of extreme grace and like a swan swimming in a sea of pageantry and pomp. After the ceremony her majesty and entourage left the port. I as rookie of the port, gasped with awe of the big occasion, that unfolded before my eyes. 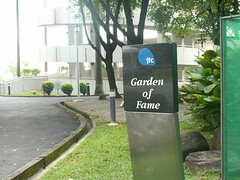 Queen Elizabeth II and the Duke of Edinburgh each planted a tembusu tree at the Garden of Fame at Jurong Hill Top. 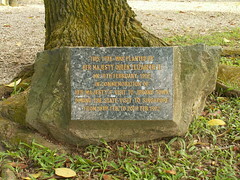 After one quarter century, the two stately trees still stand ‘majestically’ nearest to the entrance to this garden where many dignitaries from all over the world had visited in the early years of Singapore’s independence. Hi, my name is Tom Brown. I am from Edinburgh, Scotland UK. It brought alot of memories back when I came across your website, Good Morning Yesterday. I know your site is for Singaporeans and friends of Singapore of your generation, Lam. I could not help myself from sending this mail. Thanks for the memorries. Hope to hear from you. 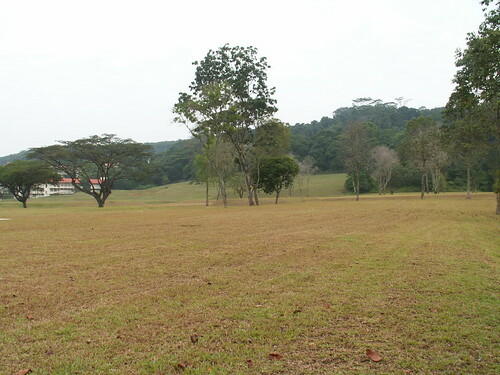 Today, Selarang Camp is home to the a drug rehabilitation centre. Hi, from the comment by Aiyah Nonya about the torture of British & Australian POWs in Selarang during the 2nd World War, I decided to do a bit of research and found a website with interesting information of the famous Selarang Incident. 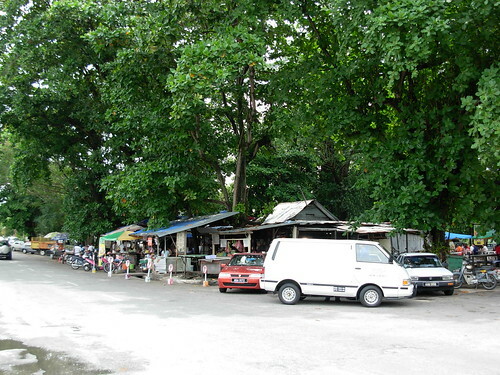 You can also read about Selarang Barracks in 1942 here. I have also copied one of their photos showing Selarang Barracks in 1942 above. 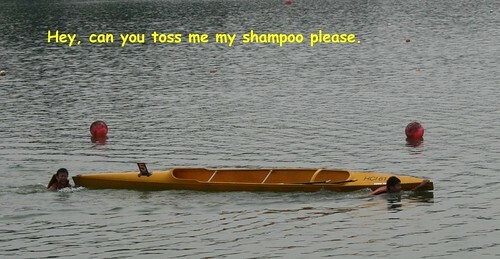 I hope the owners of the photo will be understanding about my infringement of their copyrights. - Lam Chun See, 05 April 2007.